For the Berkey’s Corner development proposal, either we agree to the drive-thru or the developer walks. Now it’s over to you for a say. Basically, at our January 22 meeting, I brought forward a motion to exclude drive-thrus from the development. Council voted (4 yays; 3 nays) in favour of that motion. Drive-thrus were out…until today. The mayor brought that decision back for reconsideration at today’s council meeting as two councillors said they were not clear on what they were voting for at the time. Council voted (5 yays; 2 nays) in favour of drive-thrus being allowed. Let’s set things straight: I don’t hate drive-thrus. That people assume I hate drive-thrus is a reflection of society’s mixed reviews on these types of establishments. If I said I didn’t want a swimming pool at that location, people wouldn’t assume I don’t like swimming pools. Lots of people hate drive-thrus; I’m not one of them. The reason I object to the drive-thru in this location is I don’t believe it fits in a residential neighbourhood. The rationale for this development is its walkability—that people who live nearby will be able to leave their cars at home, or drive a shorter distance, or ride their bikes to it via the Trans-Canada Trail when they run out of milk or want to meet a neighbour for lunch. The argument that we must cater to our auto-centric society (by providing a drive-thru) contradicts this rationale and—for me, at least—the volume of traffic that drive-thrus attract doesn’t jive with life in a neighbourhood. The people in that neighbourhood can access food, gas, and drive-thru coffee or burger 2.5 km to the north and 2.5 km to the south of Berkey’s corner. This development isn’t a need. The community could hold out for a development that turns this place into a destination, which includes a restaurant where a couple can share a romantic meal without having to worry about who drives home, or youth organizations raise money, or cyclists on the Trans-Canada Trail stop to quench their thirst on an outdoor patio. The opportunity to define a neighbourhood space like this doesn’t come along all that often. However, development applications don’t come along everyday either (North Cowichan waited many, many years for the Chemainus neighbourhood commercial development to be built). The developer stated at today’s council meeting if the drive-thru isn’t permitted, they won’t proceed with the Berkey’s Corner development. Much as it’s not cool to be held to ransom in this way, consider that the tax revenue from this development could be as high as $200,000. That’s the equivalent of over 130 homes paying property tax. We could do great things in this community with that money. Now it’s over to you. The next step in this process is a public hearing, which council voted in favour of being held at Mount Prevost School (instead of council chambers) and in the evening. I believe some councillors voted in favour of allowing drive-thrus so we could hear from the public before killing the development entirely. We hope this time and location will encourage as many residents in that neighbourhood to share their views with us. The developer said he will hold an information meeting as well. The dates for both of these events will be advertised in the Cowichan Valley Citizen. I will share them on Facebook as soon as I know. What do you think? Email Council your thoughts at council@northcowichan.ca. In my opinion, drive thru would be ok IF it is NOT a MacDonalds – I would be absolutely against a MAC in this neighbourhood! There are many who take this route home and would stop for a quick coffee or even take out, so it is not entirely a bad idea. This corner could be the last stop before heading up to Saatlam or Highway 18. While I agree that this is a great walking neighbourhood, there is also a high volume of thru traffic that goes thru Berkey’s Corner. I’m with you on this one, Maeve. With few exceptions, the sorts of development that incorporate drive-thru’s are places you just want to pass through, and not spend any time at. I would far rather park myself on an outdoor patio than i would spend time idling in a car, being funneled through a loop in a parking lot. You mention the Chemainus case. It is true the 49th Parallel development is well designed, beautifully executed, and extremely popular. But it has destroyed the town centre and ensured Chemainus will never be anything more than a fragmented bedroom community, whose future will be determined by the whims of developers. There is no more “town centre” and with that the soul of what had been a lovely and much loved little town is gone for good. Don’t let anyone say Council decisions affecting development don’t matter. Thanks for laying out the arguments so well, Maeve. I support having a drive through in my neighbourhood (Berkey’s Corner). The developer should be allowed to build it and if it really is a bad idea, if the community doesn’t support it with their dollars, then it will go out of business. But I think it will succeed. In fact, I think it’s the perfect location, due to the proximity of the soccer fields, as well as the local schools and day cares, and even the trail (I’d love a Tim Ho’s tea stop while out for a walk!). Drive throughs usually include a sit down restaurant option. These places become destination places for retired folks, the elderly, teenage daters and families, as well as other demographics. My mom’s retirement goal is to sit and drink coffee every morning at her local A&W! I’m glad this issue is being brought to the community for discussion. Our neighbourhood at Berkey’s Corner is not quaint or even very residential: we are on the commuter route and families from other neighbourhoods travel here for the school or to play soccer. As someone who chose to live here and who likes living here, I think a drive through would be entirely in line with our neighbourhood. Has NC considered how much empty commercial space is already in the valley? Location, Location and location is the three most important things.in real estate. Personally I agree with you no to the drive through. However holding the entire project up because of it makes me angrier, I don’t normally go to these meetings but I think I may now. The Project Rationale lists Coffee (drive-through) and Restaurant as two separate tenants. I will assume this likely means a Starbucks or a Tim Horton’s for the drive thru and NOT a fast food burger chain. If the developer could confirm this to the public he may have more sympathetic ears, and I think he may need some after this seemingly heavy-handed take it or leave it stance. Where’s the “flexibility” and that was affirmed the previous council meeting? To expand on Patricia’s comments regarding traffic, the Cowichan Lake Rd/Skinner Rd intersection has the 2nd highest traffic count in the municipality. It is already a major artery and this will not change. I have no issues with traffic to the site. My concern is with traffic flow and children’s safety exiting the site. I would like to see all left turn exits eliminated on Cowichan Lake Rd, an entrance/exit onto Skinner, and a roundabout constructed at Cowichan Lake/Skinner. Traffic unable to make left turns out of the development can be guided to the roundabouts as u-turn points. I have no problems with the Land Use decisions made by council. I do, however, have serious issues with the design. A strip mall does not make for a good neighbourhood place. I’d like to see less parking and an increase in the public relam: more public plazas and benches and gathering places (not private establishment consumer-only patios), wider walkways with tree canopies and planters, etc. No to the whole development, with or without a drive-through. I like the site just as it is. I hope North Cowichan gives consideration to health as well as economics in it’s decision on drive throughs. I hope North Cowichan considers the health effects of vehicle emissions as well as economics. While the proposed development promises some construction jobs, the economic impact on the community will be minimal and the local impact will be negative, with or without the drive-through. There is also a closed restaurant and gas station. Local residents will lose local flavours with little improvement in convenience, as there are several excellent shopping choices within walking distance of the proposed development. The location is 1.5 km from Cairnsmore with a 7/11 convenience store and gas station and the full-service 49th Parallel Grocery. 1.5 km in the opposite direction is Cowichan Commons with a wide range of shops ,and big box stores, including groceries and a pharmacy. 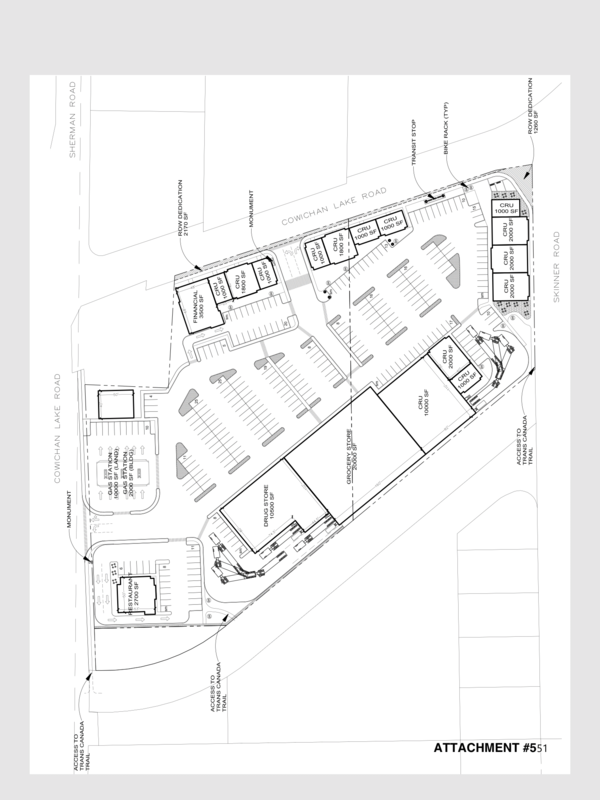 The claim that the proposed strip mall will reduce vehicle use seems doubtful in view of the large proportion of land the developer is devoting to parking spaces and a drive-through restaurant. If this isvreally a development for local people, wvwalk-through mall with only enough parking for employees would make more sense. There does not seem to be a demand for more retail space at this time. There are about 12 empty store fronts at Cowichan Commons and one empty restaurant at this intersection. Retail businesses do not provide an economic benefit. The only benefit for North Cowichan will be to shift some shopping from the City of Duncan to the municipality. While this may benefit the tax base, it is not, in any sense, a benefit to the community. This neighbourhood is a suburb of Duncan and loss of businesses in the downtown core will hurt everyone’s quality of life. I don’t support a drive thru in this particular location. I worked at a fast food joint for 7 years in my teens in a neighbourhood setting – and what I saw from this vantage point was enough to turn me against fast food in this kind of setting: distracted driving leading to pedestrian accidents, garbage out the window, ubiquitous 24-7 deep fry odours and drive thru robbery attempts with weapons. I’m not anti-drive thru, I just prefer to get my fries on the highway. Its easy to see that this is a very densely populated residential Neighbourhood. Its also very very high traffic zone. Do we really need this, traffic is already an issue, do we want more. We have a number of small, local business in very close proximity. Has anyone considered what this will do to them. We have a lot of empty commercial space in the Valley, take a look around. If this goes ahead we will have more, right opposite this development. Is that progress ?? We are in danger of segmenting our town into smaller townships with developments like this. I can tell you that this is not a good thing. How about helping the existing, local business develop and succeed rather than give in to developers and big coffee shop chains who’s only real goal is to make profit, not be part of a community. As a resident of the area, living west of the roundabout, I welcome this development. The current services at the intersection are of poor quality and high price. There isn’t even a proper grocery store – the current “market” is essentially a fast food emporium catering to school kids – and there is nowhere to buy groceries at reasonable prices. I’m not a big fan of drive thrus, but if that is the price of getting this done, then I can accept it. I agree with earlier posters who suggested a coffee-ish drivethru would be preferable to something like a McDonalds. Having a market in this location would definitely reduce our family’s environmental footprint, as it would localize a number of trips to Commons and Superstore malls, and it puts a market within easy biking distance for our kids, along the TransCanada Trail. The North Cowichan Berkey’s Corner development should never be allowed to proceed. Who is that’s saying we need any development there? I know without a doubt that the majority of those who feel like a project in this area would be beneficial are those who would either never use, or use very infrequently, the services of such a project. A majority of the supporters who actually have a vote in this proposed project won’t even be living nearby where the detrimental effects of more commercialization would impact their way of life. I’m also sure that those commuting to work and using the Berkey’s corner roundabout don’t want to be backed up anymore than they already are going to work, school, and appointments during the busiest times of day. A drive-through in that area is a ludicrous idea. Haven’t any of those supporters either observed or experienced the rather lengthy and long lineups those coffee drive-through have to offer on an all too frequent basis? All those car engines idling away while patrons wait for a coffee. I can only think it must be the nectar of gods for customers to wait such a long time. I love coffee, but it’s astounding the gas and time from their lives others are willing to spend to get that amazing cup of coffee. Their car engines spewing exhaust into our environment and all for a cup of brew. I don’t want or need the added light pollution, engine exhaust, traffic, and other detriments a drive-through offers in the area where I live. Wouldn’t it be smart to build a project near where you think it would receive support from local residents? The same residents North Cowichan Councillors and the Mayor think will do business in this new development. Who is it that will reap the benefits from this project? Do you call bulldozing land and taking away what natural surroundings are left in that area and replacing it with bricks and mortar, and untold amounts of traffic, a benefit? I live in the immediate vicinity. I can view Berkey’s corner from my residence but I’m not right next door. I’m a regular user of the local trail system and enjoy the trees and natural surroundings immensely. The trail system that connects with the Trans Canada trail that begins near the proposed development, would be ruined by the onslaught of commercialization in an area that just doesn’t need it. What about light pollution? Has the impact of light pollution be considered? There are owls, rabbits, deer, and other wildlife that live and use the trees and bushes in that area. I think it’s pretty cool to see an owl. Too bad clearing more land will make that wonderful opportunity even more difficult or impossible to experience. How many people who use the trail directly behind this project will enjoy the cement scenery, lighting, engines idling in the drive-though, and the added noise? If I had a vote in the matter I can tell you it would be NO. I urge those of you who read this post to reply with a vote of YES or NO as to whether you would support such a project at Berkey’s Corner. It’s not just the recent proposal we need to be concerned about. It’s about the future as well. I agree, the development is a stupid idea. There are vacant retail shops right across the road and at Cowichan Commons. There is a grocery store at Cairnsmore. The property should be a community park where people can hang out without joining a sports team. It would be a great shop on the TCT. What we need if we want more influence in our community is a neighbourhood association.